“We ski,” my daughter replied. 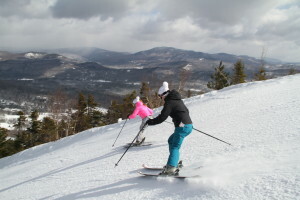 Since our kids were first learning to turn, we would take them to Sugarloaf or Sunday River for Easter weekend. We have skied in cold wintry blizzards and gorgeous sun with soft squishy snow. That’s spring skiing in New England for you. There have been many Sunrise Services, where we woke before dawn and loaded a chairlift in the dark, to witness the sun rise over the mountains followed by the most glorious ski down the mountain before it opens. 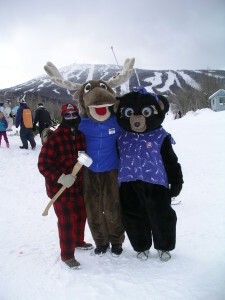 The kids have found Easter eggs and chocolate on the ski trails, they’ve even worn costumes and bunny rabbit ears, had their pictures taken with Amos the Moose and Blueberry the Bear over the years. If that’s not a tradition, I don’t know what is. 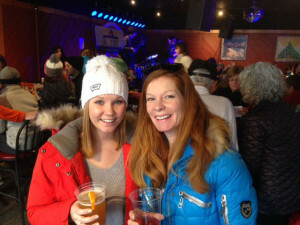 So when my daughter requested coming home for Easter weekend from college to ski, we were ecstatic. Skiing together as a family – first tracks on Sunday morning was priceless and precious at Sunday River. She’s a little grown up for egg hunts and mascot photos with Eddy and Betty the Yeti, preferring lunch at the Foggy Goggle with a more adult beverage, but the mountains of memories continue to be made. I hope your family enjoyed their Easter tradition as well. The spring skiing in New England is the best right now… so get out and enjoy those high elevation ski resorts still 100% open. How was your ski season? 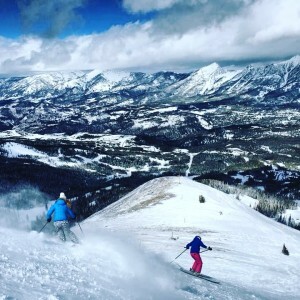 April 1, 2016 / Family Ski Trips / Comments Off on How was your ski season? How was your ski season? Did you ski your age in # days? That’s always a goal of mine, it’s exponentially more challenging each winter. 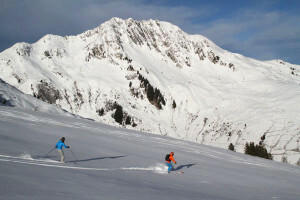 I like to envision my 80 ski days when I am retired at 80, and (hopefully) still fit and carving fabulously. Klaus Obermeyer, Aspen-based famous ski clothes designer from Germany, had the goal of skiing as fast as his age, he’s now 95. I think my approach is safer but you go Klaus! abysmally low snow totals all season long. Mad River Glen was only open 45 days. New England ski resorts struggled, many didn’t make it to Easter weekend which was super early – still March. A few kept making snow into April, Sunday River and Killington, way over snow budget. Sunday River, Sugarloaf and Sugarbush made it to May Day, Killington keeps spinning. weather writing on the wall, I hashtagged this winter #GoToTheSnow. And that’s what I did. 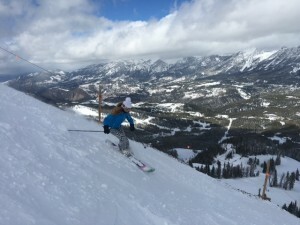 I skied pow from start to finish, soft snow at Vail and Aspen-Snowmass in mid-December, to my finale at Big Sky Montana on Easter in a foot of fresh. I ventured to Austria in January, skiing Kitzbuhel, Innsbruck, Zillertal, SkiWelt and Alpbach, then flew back to Colorado in February for more white gold at Copper and Steamboat. I ended with 49 ski days (I don’t turn 50 till July this year – so I legally accomplished my goal). Of those 49 days, only 7 where bagged in balmy New England. I hit 30 different resorts, a stat I find pretty cool, from East to West to Europe. My best ski day? There was the stellar sunny day in Kitzbühel Austria when I skied the Hahnenkamm course the week before the world’s best downhill skiers hit this hairy race course. 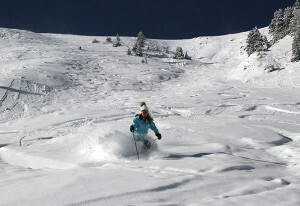 In Aspen, we had powder days at Ajax, Aspen Highlands and Snowmass – so we certainly hit that jackpot. First tracks in 9 inches of fresh snow at Steamboat was pretty sweet too. My favorite ski run was probably a moonlight ski down at Sugarbush Resort in Vermont on an unpredicted 8-inches of powder that fell during our mountaintop beer pairing dinner in mid-February – cheers! 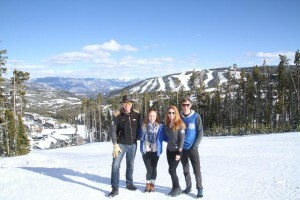 The best ski trip was Big Sky Montana, because our family of four was reunited on the snow. We hadn’t shared a family ski trip in four years (while the kids were in college). 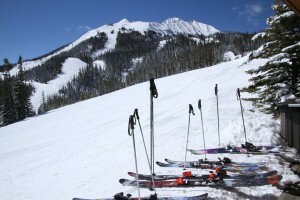 Staying in a cozy mountainside cabin, we could put our skis on for first tracks from our Cowboy Heaven deck, and do laps on the Lone Peak Tram, and the Six Shooter high speed six-pack chair, skiing all of Big Sky’s amazing 5,800 acres. We had fresh snow almost daily, except for the gloriously sunny Saturday prior to Easter. Skiing the Dictators steep and deep with our son, and cruising cord on Tippy’s and Silver Knife with our daughter were the stuff ski dreams are made of. Of course, we had the inevitable family fits, travel hassles, planning our canned family ski photos, and bickering about which Big Sky trails to ski, but that’s what gives downhill skiing its uphills. It’s time to tune my skis and set my sights on next ski season. I’m shopping next Season’s Pass deals too. The Epic Pass is super tempting with unlimited skiing at Vail, Beaver Creek, Park City, and three ski resorts in Lake Tahoe… to name a few. The Max Pass is another multi mountain deal including Big Sky, Bachelor, Solitude, Steamboat, Copper and Winter Park and my East Coast favorites Sunday River, Sugarloaf, Loon, Killington/Pico, Stratton and Tremblant. I will let you know which ski pass I purchase to #GoToTheSnow.